I am an English teacher and I love my Work. 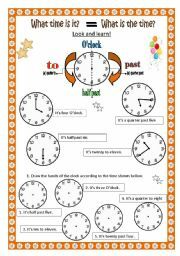 Students have to read and draw the hands of the clock according to the time shown. Two pages. 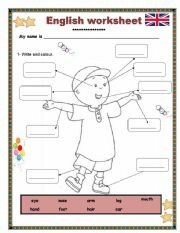 This is a re-uploaded worksheet. The worksheet has two pages now. Students read the text about Maria and answer some questions. 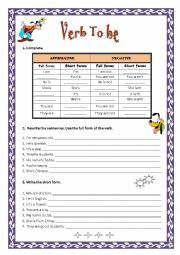 Then they have more writing exercises on the other page such as: verb exercises (To be and to have got), and some descriptions. Some graphics are from http://www.mycutegraphics.com. Hope you like it! 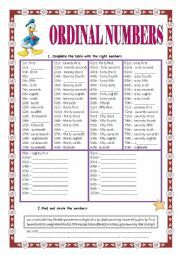 Students have to do the exercises about ordinal numbers. 2 pages. Hope you like it! 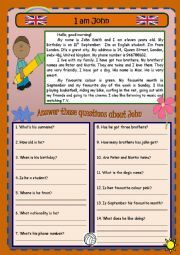 It´s got 2 pages with simple present exercises. Hope you like it! 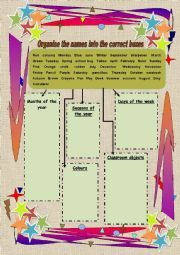 Students have to write the words in the right boxes. Hope you like it! Two pages with exercises about the cardinal numbers. I hope you like it. 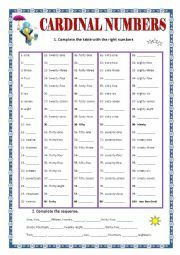 Students have to do the exercises about the verb To Be: Long and short form, negative form, order the words... 2 pages. 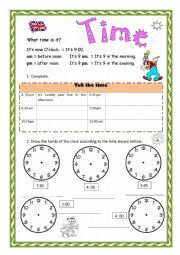 Students have to complete a table and write the time of the clocks. Write the body parts and then colour it.